This passage leads us to the inner mandapa. The elevated inner mandapa is a pillared hall with closed enclosure. The enclosure wall of the mandapa in the south has an aperture in the middle and a flight of five steps arranged in front of it leads us to this mandapa. Both on the eastern and the western side the enclosure wall extends towards north and ends adjoining the mother rock. 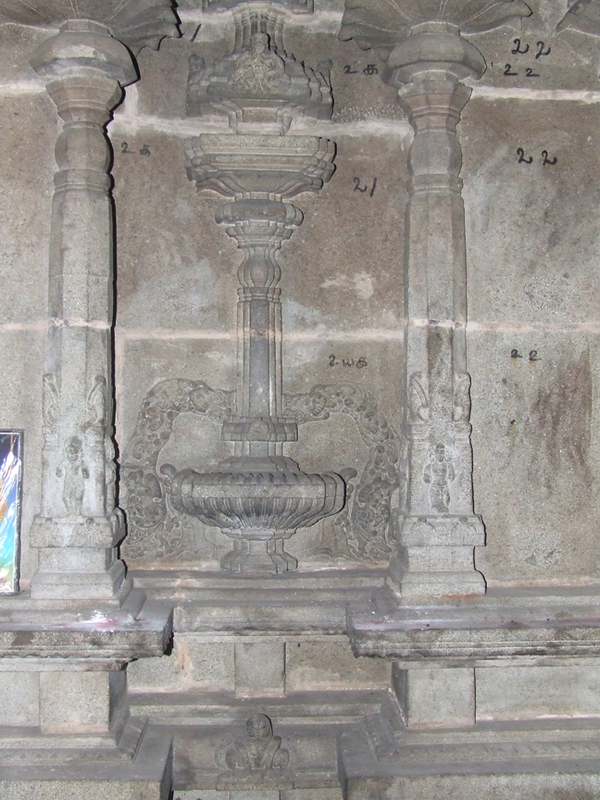 On all the three sides the wall is shown with the features of a padabanda adhisthana, bhitti sectioned by pilasters and prastara. Coming to the inner side of the mandapa, comparing to the east the mandapa extends more on west. 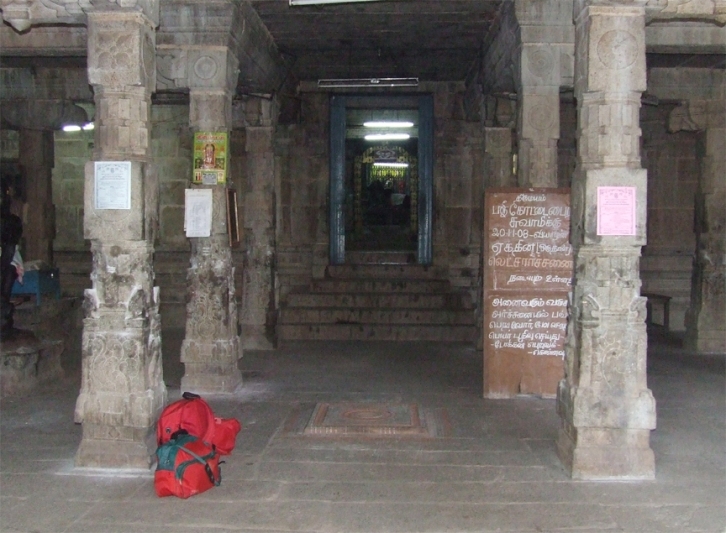 On the western side in the middle a shrine for Goddess Venuvaneswari facing east is seen. Both on the north eastern and south eastern corners a small structural cells are seen facing each other. 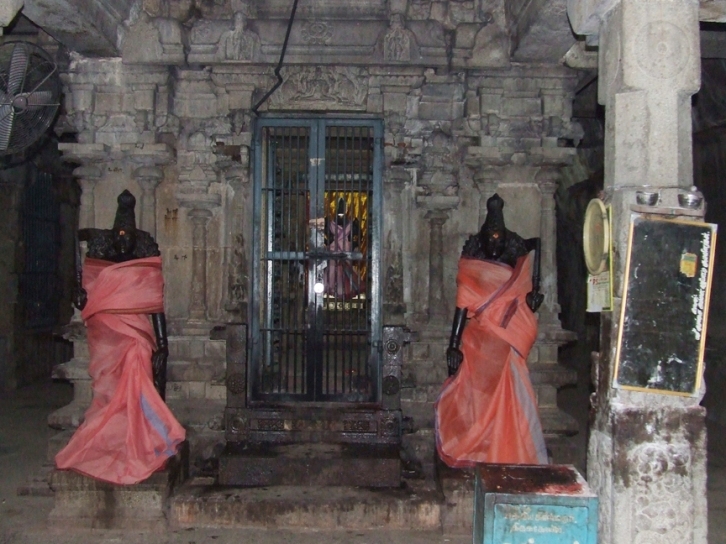 The south western side of the mandapa is enclosed with iron gates as a provision for bronze icons. The western side of the mandapa has a raised platform. The pillars of this mandapa are massive as like that of the outer mandapa. The pillars have three squares and kattu in between them. 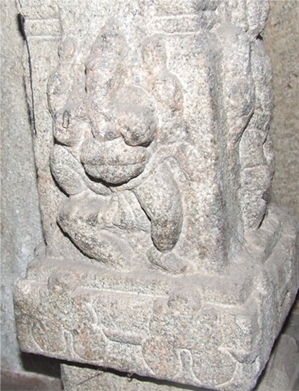 They have a upapitha base. The squares are adorned with either scrolls or miniatures. Two pillars arranged in the second row in front of the Goddess shrine are noteworthy. 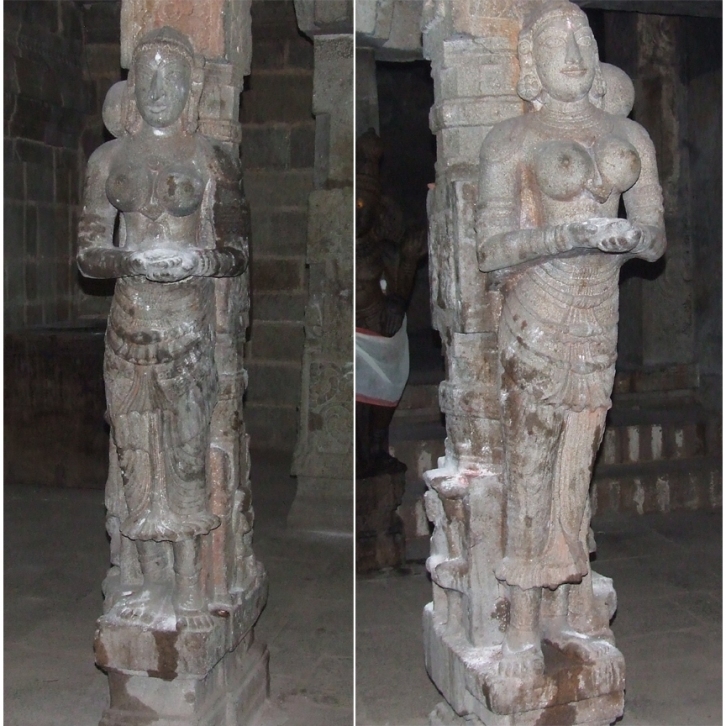 These pillars possess the sculptures of Vilakkupavai or the Lady with lamp. The sculptures of the ladies are very decorative with their hairs arranged as a knotted bundle, wearing only a lower garment to which the gatherings are arranged in stride in the front. Both are fully decked with ornaments and elegantly holding a lamp on their palms with a smiling face. 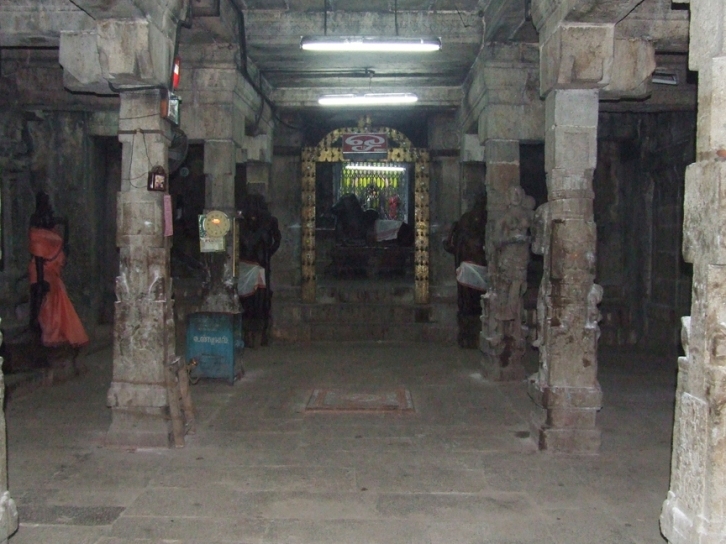 The Venuvaneswari Shrine consists of a sanctum and mukhamandapa with an adhisthana, bhitti and prastara, which adjoin the roof of the mandapa. Vargabedha adhisthana is followed, in which, the karna sections have padabandha basement and the sala sections have kapotabandha basement. The bhitti is cantoned by ornate pilasters. 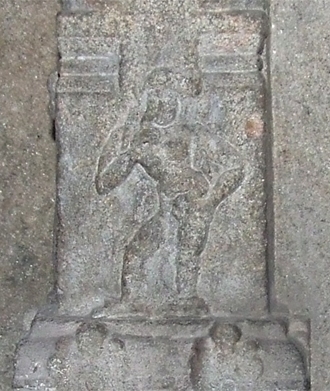 In between the bhitti and adhisthana is shown the vedika component. The pilasters are very decorative which have a upapitha base and above it raises the usual pillar with a square base and nagabandas adorning the corners and vishnukanta shaft with usual upper elements. The squares are decked with miniatures of gods, goddesses, animal figures, rishis ect. The pilasters in the sala sections are multi ridged. 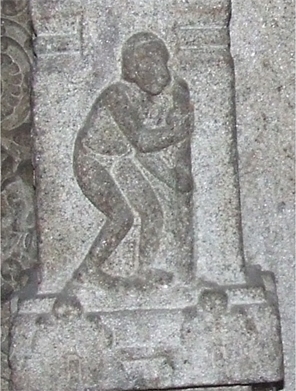 The recessions in between the sala and karna sections are shown with kumbapanjara. The kapota is decked with kudu arches but miniatures are seen only in the kudus above the entrance. Above the kapota is the bhumidesa with makara heads. The bhumidesa adjoins the roof of the mandapa. 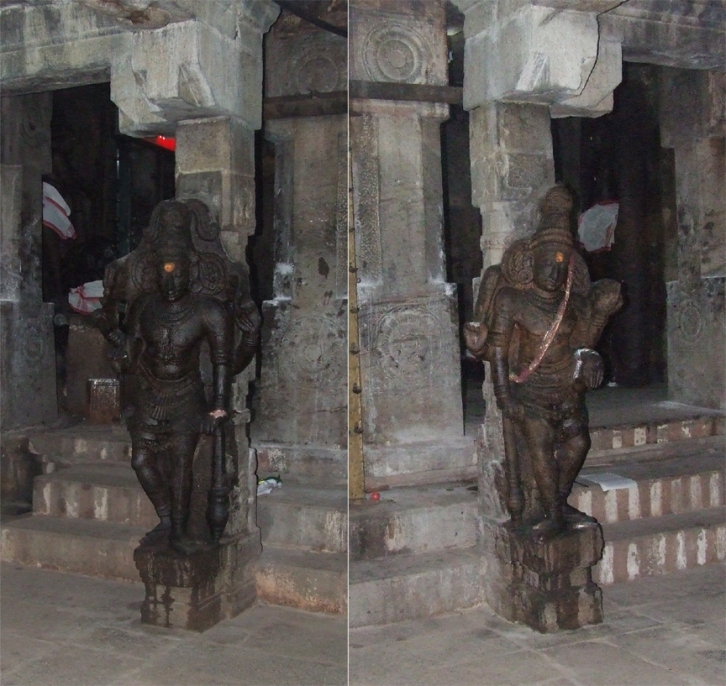 In front of the mandapa two dvarapalikas are seen guarding the shrine. 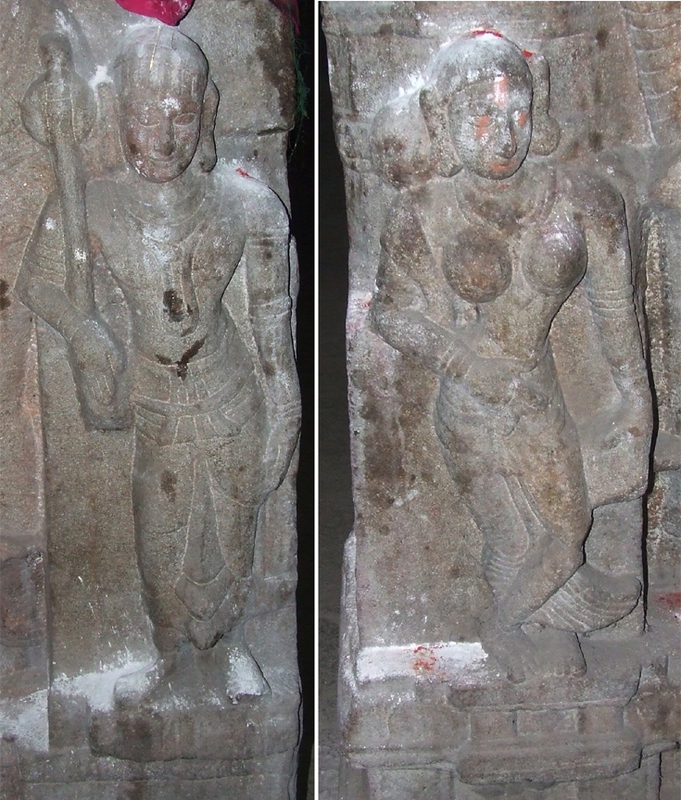 Both standing in sama with their inner hand resting on the plank and their outer hand holding the sword in upright position. Both are clad in jatamakuta, ornaments and lower garment but are formidable with their spew out eyes and side tusks. The entrance to the shrine is very decorative with twin pilasters flanking the entrance and the door frames are ornamentally carved. 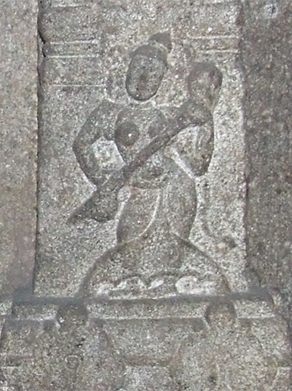 The miniature of Gajalakshmi is shown above the entrance in the lintel. 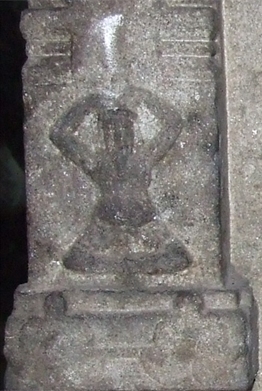 The sanctum houses Goddess Venuvaneswari in samapada posture with the back hands holding flower and the front hands in abaya and varada. The deity is clad in silk dress, jatamakuta and ornaments. Thank you, bye for now. In the next episode we see the Sathyagiriswara rock cut cave.